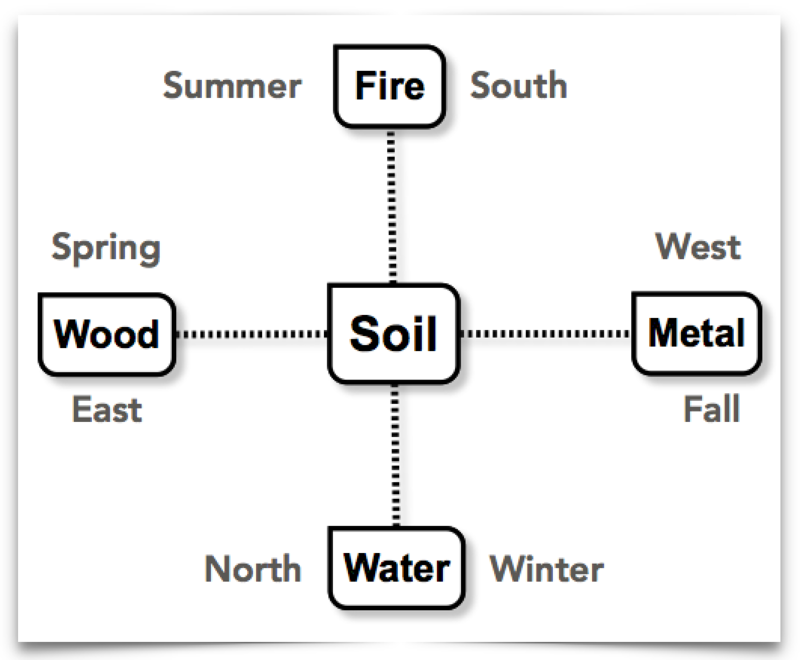 The Five Phases, along with Yin-Yang, form the foundations for understanding and communicating within Chinese Philosophy and Chinese Medicine. They provide the linguistic bases for these and other areas. Unfortunately, akin to learning a language, initial understanding and usage can be difficultly and trying. As a result many people stop short in their studies of Five Phases and Yin-Yang. . Both yin-yang and the five phases were early approaches to understand nature, it’s on going processes and mankind’s place within nature. 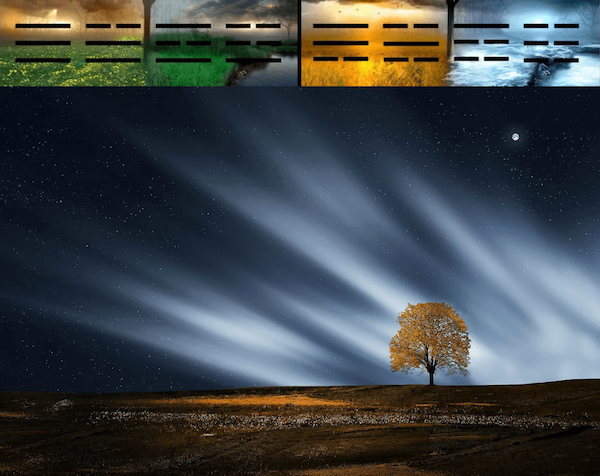 Yin-Yang and Five Phases developed independently in northern and southern China respectively. It was only later they were combined to form the constructs we know today. Yin-Yang looks at, and assess, complementary natures and qualities which arise from comparisons. Five Phases provides a means of categorization of qualities, characteristics and actions. Unlike western approaches to categorization which hierarchically segregate, the intent of Five Phases is to unify. The concentration of this missive will be on Five Phases. In western Chinese medicine schools students are introduced to both of these concepts, usually in first level theory classes. Unfortunately this segues into an emphasis placed on memorization – e.g. point locations and indications, Zang-Fu patterns, herbal actions and formulas, etc. Discussions of the core meanings of the Five Phases, as well as yin-yang, tend to be rudimentary. In order to understand and advance an area of study more deeply, these subjects should, themselves, be of just as much study. So, why “Five Phases” in lieu of “Five Elements”? When studying concepts in different cultures it is important to match intrinsic meanings in discussions as closely as possible. This ensures a more valid cross understanding with fewer artifactual ideas resulting from less precise terminology. While many writings employ the term Five Elements, “element” does not convey the full meaning appropriately. If we look at a definition of “element” we see that the basic concept is that of a substance. Where elements are non changing, distinct materials, the use of the term “Phases” provides a more accurate communication of the associated philosophical meaning. “Phase” augments the concept of a substances and includes relative relationships, actions and interactions. Or, more specifically, a phase is a stage in a process of change or development. The idea of an element is then inherent in the concept of a phase. Chinese medicine is a medicine of systematic correspondences sourcing from the philosophies of Yin-Yang and the Five Phases. As a result, correspondence tables tend to be the primary approach to the presentation of the Five Phase paradigm. Unfortunately, left at face value tables have an unintended consequence of limiting the Five Phase concept to “substances”. Correspondence tables are a stagnant presentation incapable of transmitting aspects of change and development. Tables are more associated with prominent current teaching approaches in which emphasis is on packaged facts and not referential knowledge. Transmittal of the information contained it the tables was originally interactive allowing for a greater conceptual understanding. One of the artifacts that results from tables is the idea of distinctness and separation. As with Yin-Yang, there is an interconnectedness between the Five Phases. In analogy, where there is no Yin without Yang, and vice-versa, likewise there is no single Phase without the presence of the other Phases. And, as nothing is pure Yin nor Yang, nothing is of a pure Phase. When considering something from the Yin-Yang paradigm both must be considered, from a Five Phase paradigm all the Phases must be considered as well. Limiting– Each Phase limits the freedom of process of another Phase, but does not hold the Phase back from pursuing its processes; Likened to a policemen directing traffic – limiting full freedom, but not holding back the traffic. 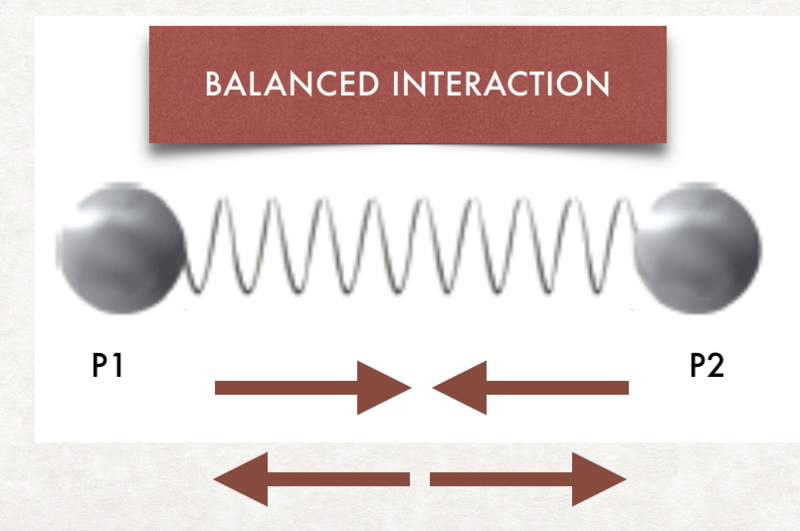 Imbalance occurs when there are Excess and Deficient states of Enabling and Limiting. Enabling and Limiting are related to the more familiar terms of Generating, Controlling, Over Acting and Insulting as indicated in the associated diagram. As indicated in the Nanjing excerpt above, Five Phase assessment and treatment are utilized in Excess (Repletion) and Deficient (Depletion) conditions. This is the logical extension of the Enabling and Limiting interaction sequences. We are working on a more extensive, instructional construct on the Five Phases which can be made available in the future. Please contact us to express your interest in a more detailed presentation of the classical Five Phases at Info@CypressPavilion.com. As a closing observational note, nowadays, especially in the West, there is a tendency to confine Five Phase assessments to emotional treatments as a result of correspondences. Although applicable to psycho-physiological conditions and ensuing emotions, relegating the Five Phase paradigm primarily to emotions illustrates a severely constrained understanding. This should not be a distraction from the greater applicability of the paradigm to assessing and balancing broader changes in health aspects and even social interactions.